This summer an ocean adventure awaits you! We will be heading to the sea, but learning all about the most important “C”, Christ! 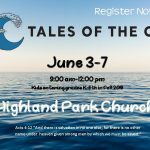 Grab your beach bag, bring your friends, and let’s dive into “Tales of the C”.